Augmentation, broadly defined, covers all of the activities that improve the effectiveness of beneficials (DeBach, 1964), such as new species releases (inoculative or inundative), planned genetic change, landscape modification, and so on. The addition of a new species or strain of species into a new area increases species diversity, but it can also affect interspecific relationships and population genetic characteristics. There are two main types of releases, inoculative and inundative. Inoculative releases utilize species intended for permanent establishment, where progeny of each successive generation continue as regulatory agents. Inundative releases utilize species intended for short-term action (permanent establishment not expected) and act as biotic insecticides. Discovery, mass-rearing, and redistribution of endemic resistant populations of beneficials against target pests, or laboratory-planned genetic alteration, hybridization, or artificial selection for pesticide-resistant beneficials and subsequent field release, are measures intended to amplify existing levels of biocontrol. The use of such agents is expanding rapidly. Common cases include predatory mites, aphid predators, and parasitoids in deciduous tree fruit and nut crops (Hoy, 1985; 1995; Croft, 1990; Johnson and Wilson, 1995; McMurtry et al., 1995). Land management planning and IPM efforts must consider biocontrol issues, the players, their role, protection, and sustainment. 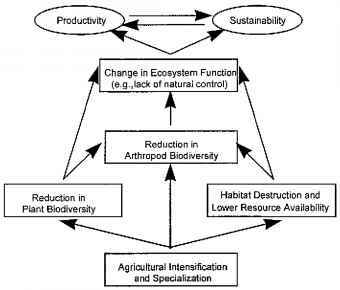 Agroecosystems are linked not only to the surrounding natural lands, but also to biological diversification from distant sources (van Hook, 1994). Beneficial insect diversity needs to be dealt with as part of the overall diversity of the landscape. Biodiversity exists in a matrix of habitat patches including managed and natural environments. The landscape and beneficials are ecologically linked and interdependent (Carroll, 1990; van Hook, 1994). IPM programs, though strongly based on ecological principles, still rely heavily on reductionistic approaches to control single pests on single crops (van Hook, 1994). Discussions on beneficials often center on the interdependency of specific habitats. Although it may not be possible to view all of the biological peculiarities of an ecosystem or to make overall generalizations, greater accounting of multiple factor linkages and features in common (e.g., epigean fauna, role of flowering plants, stability of plants, crop culture specifics, etc.) are necessary to appropriately understand, conserve, and manage beneficials in relation to their phytophagous hosts. Some beneficials may be linked to their prey/host for only a part of their life cycle. Altieri (1983) divided the crop landscape into two groups: (1) heterogeneous (crop, meadow, woodland, windbreak, etc.) and (2) homogeneous (continuous crop cultures). The latter could be further subdivided into extensive plantings of annual monocultures, (e.g., small grains), semiperennials (e.g., alfalfa), perennials (e.g., grapes), or mixtures of these in small to moderate size. The most effective beneficials in agriculture are usually species that are perennially present in farmlands. Long-term agricultural landscape optimization should support equilibrium between pest and beneficial, achievable in part or in total, through extended diversification of crops and wild plants, or through development of biocorridors adjoining particular managed habitats (Petr and Dlouhy, 1992). Farmland optimization will vary broadly between areas, but certainly will require long-term ecological planning and commitment with the flexibility to accommodate new discoveries for improved activity and perennial sustainment of desired beneficials. Today, high-yielding, high-quality, insect-, disease-, and weed-free monocultures require high-energy inputs to produce and harvest. With production costs escalating, interest in enduring and efficient alternatives with less dependence on fossil fuels is escalating (Gross, 1987). Central to this is the management of agricultural communities (Altieri, 1981; Altieri et al., 1993), where selective diversity in, or in association with, cropping systems is used to enhance the stability, survival, and efficiency of the natural community inhabitants (Gross, 1987).